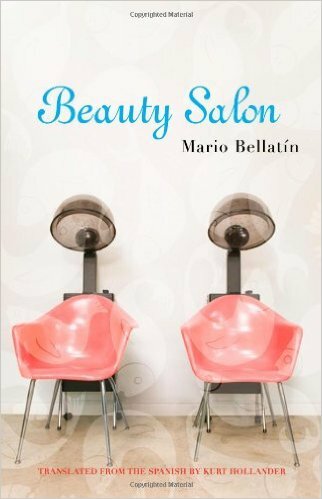 At a mere 63 pages, Mexican author Mario Bellatín’s novella Beauty Salon (Salón de Bellezza, 2000) seems more expansive than many works ten times its size. This is still more surprising given the limited raw materials with which Bellatín works. The book contains a single overarching allegorical conceit – a beauty salon turned into an informal hospice. Accompanying this rather grim bass line, like a wandering melody, is a symbolic motif: the salon owner’s management of various aquariums he’d installed during the salon’s heyday. By presenting such a delimited world, Bellatín can drop into his narrative, in the way his salon owner adds brilliantly-colored fish to his tanks, small signifiers that have space to swim around and amplify their presence. We never get to know the name of this compelling first person narrator, who recounts to us steadily, in an almost methodologically controlled tone, the transformation of his business from a popular women’s salon run by drag queens into a hospice for men dying of a plague. He has adapted the space, replacing the hair dryers and other salon equipment with cots, keeping the aquariums. Socially he is alone except for his “guests,” though he wistfully recalls his drag queen friends – “the only friends I ever had” - who died “long ago.” That his clients are mostly young gay men and that their symptoms suggest opportunistic infections obviously alludes to the AIDS pandemic, and Beauty Salon should easily find a place among the roster of powerful fictional engagements with AIDS. But by keeping the disease imprecise, Bellatín’s book acquires allegorical power. We don’t get to know much about the narrator’s clients either, some of whom die quickly while others hang on. The narrator keeps an emotional distance from them, ministering to their needs but avoiding attachment, with one exception, a small tear in his veil of stoic professionalism, about which he harbors regrets. He operates under the radar, refusing the presence of doctors and offers of help from a religious charity, and in fact prohibiting medicines, prayer and religious materials in the salon. The only donations accepted are “money, candy and bedclothes.” Even visits from relatives and lovers are forbidden. He also has to fight off antipathy from not-in-my-backyard neighbors who don’t want a hospice full of sick homosexuals in their midst. The neighborhood itself is dangerous enough as it is, afflicted by intractable poverty and by the vicious “Goat-Killer Gang” responsible for innumerable murders. Throughout Beauty Salon one senses an external neglect and indifference as regards the dying, such that the salon – while far from being anything akin to an oasis – at least provides a place for those who otherwise would be left to die under bridges and on the street. And of course, the narrator himself is ill.
Providing some color in this atmosphere at once oppressive, claustrophobic and even apocalyptic, are the narrator’s aquariums. Initially placed in the salon as a means of giving the clients something to watch while getting their hair done, the tanks now ostensibly provide some solace to the dying, though most of the clients seem oblivious to their presence. The narrator himself feels guilty over the money spent on the fish, and, in the fish store, at being “surrounded by all that life.” But regardless of the impact of this attempt to bring color and life to the dying, it’s clear that the space would be qualitatively different without such an effort. Even if the “guests” exhibit little appreciation, attending to the fish helps sustain the narrator. As I’ve mentioned before, they are resistant and despite the minimum amount of care I give them they have managed to hold out, some dying while others are born. The water, though, isn’t very clear anymore. It’s taken on a greenish tinge, fogging up the glass walls of the aquarium. I’ve placed this fish tank somewhat away from the guests. I don’t want their rot to reach the water; I don’t want the fish to be infected with any fungus, virus or bacteria. Sometimes when no one is looking I put my head into the fish tank and I even go so far as to touch the water with the tip of my nose. I breathe in deeply and it feels as if life emanates from the water. Despite the smell of stagnant water I can still feel a certain freshness. Increasingly the aquariums suffer under the weight of responsibility and the narrator’s own illness, the fish struggling to survive in much the same way as the narrator’s clients. Thanks to the Caravana de Recuerdos blog’s months-long Mexicanos perdidos en México [Mexicans Lost in Mexico] reading challenge, I happened to read Beauty Salon around the same time I read Juan Rulfo’s classic Pedro Páramo. Otherwise I might have missed Bellatín’s evocation of his predecessor’s novel. Beyond the similarities in both books’ concern with that central Mexican obsession, death, and the presence in both of spectral lives hovering almost indistinguishably between life and death, Bellatín also echoes Rulfo’s ability to conjure a whole country, to use a simple conceit to provide a striking portrait of Mexican torpor and indifference. One discerns, in the epidemic and in the milieu of general social neglect, a dystopia. Bellatín’s setting evokes Mexico City and its lost, interminable streets, the pervasive influence of drugs (one client recounts having been a drug smuggler), the heavy threat of violence and an affliction of self-interest. The disease is coming from inside the house in Bellatín’s devastating image of contemporary urban Mexico. But the most powerful aspect of Beauty Salon is its constant and careful modulation of the entwined systems of care the narrator exhibits towards his dying “patients” and to the fish in his aquariums, a microcosm and reflection of the world outside the aquarium glass and gestures both moral and aesthetic in response to calamity, imperatives which, like the creation of art, can remain largely mysterious even to the one effecting them. Bellatín’s minimalist novella, an extraordinary feat of concision, seems itself a kind of small aquarium, allowing a gaze into the manner in which those afflicted by poverty and illness are neglected, how violence is endemic, how minimal displays of courage and responsibility can reveal the poverty of institutional efforts, all underlined by both the incredible resilience of those, human and fish alike, determined to cling to life. The reader too becomes a kind of witness and caretaker, forced to probe his or her own responsibility. Pulling my head outside of Bellatín’s small book, I could not help but be struck, as when I emerged from Albert Camus’ The Plague (with which Beauty Salon has many parallels) by the fragility of social relations and the terrible vulnerability of those at the margins, the profound loneliness of dying, and the potential impact of even the smallest and must humble gesture aimed at creating something of beauty in a grim world. If, as has been asserted, contemporary Mexican literature may itself be in a rather grim state at the moment, Bellatín’s powerful little novel amply demonstrates that it still holds flashes of beauty, alive and deserving of urgent attention. I didn’t set out to read Primo Levi’s The Search for Roots. It popped up in my search for something else, and I don’t intend to delve deeply into it here. But I found this collection, of 30 personally-chosen excepts of writing the author found “essential,” each accompanied by Levi’s own brief commentary, to be rewarding from cover to cover. I’ll highlight a few bits, particularly two selections I was thrilled to find. Starting with “The Book of Job” and concluding with an essay on black holes, Levi’s selections journey from Rabelais to Darwin, Conrad to a manual on laboratory safety, Jonathan Swift to a page from an American trade standards text concerning the testing of an adhesive for trapping cockroaches. The choices are weighted about one fourth Italians to three-fourths writers from elsewhere. With neither apology nor prejudice, Levi admits his surprise and embarrassment, however, at having omitted, in his “nocturnal work,” women and non-Westerners. As I’d been lead to the book in pursuit of a particular Italian work, I was most interested in Levi’s Italians. In this regard the book proved a great find. From Roman sonneteer Giuseppe Gioacchino Belli, Levi includes four sonnets, three completely new to me. A compelling excerpt from Mario Rigoni Stern’s 1978 novel, Story of Tönle, tells of a shepherd during WWI confronting a group of Austrian soldiers on his farm and arguing plainly with them in favor of the peaceful continuation of his routine farming responsibilities, a request denied, of course, by the soldiers, but which starkly reveals the disruptions of war. Levi also includes part of “The Day,” by Giuseppe Parini, an 18th century poet whose wry depiction of the aristocracy amid the “crush of heroes” they offer up to one another as models, provides amusing portraits of these privileged Italians, hardly capable of seeing themselves as ordinary, engaged nonetheless in ordinary idiocies. What is it, Barberina?...It hurts…Where? here…It was perhaps…? Yes, that bear! she gave up her naked body to my inspection. I don’t believe we’d have ever got it back. The reason I’d come across Levi’s anthology in the first place, though, was to have a chance to read what may be the only published excerpt in English of another significant Italian work unavailable to English readers, Sicilian novelist Stefano d’Arrigo’s massive novel Horcynus Orca. Described as a re-invention of "The Odyssey" and a meditation on forms of death, Horcynus Orca consumed decades of the author’s life and went through endless revisions until it first appeared in print in 1975 to great acclaim. A proposed English translation never materialized due to competition between publishers; the sole translation to date, into German, appeared only in 2014. “Urchin Death,” Levi’s excerpt of this 1,100 page monster, gives a glimpse of the work both tantalizing and grim. As the Nazis are being driven from Naples in 1944, a group of street urchins have thrown a makeshift grenade beneath a German tank, halting its movement and forcing its driver to emerge. For ten long pages, d’Arrigo lets his narrative rest squarely on the tension between the soldier’s certain, impending death and the subtle, almost cinematic series of moments and glances and gestures that pass between the children and their prey, the tension broken only briefly, an eye in the storm, by the strange arrival of a young girl leading her blind father over to check out the situation. If the rest of the novel is anything like this short, powerful passage, translators should be lining up. So there: two glimpses of major works of Italian literature as yet untranslated into English accompanied by 28 other “essential” pieces of writing, chosen by a writer of formidable talent who affirms that authority can be conferred by being an engaged, perceptive reader with no small degree of discernment when it comes to knowing what is meaningful. The Search for Roots makes for worthy reading for anyone, an unusually rich place from which to start exploring in myriad exciting directions.